This compact system for carbureted applications is designed to be a true "cheater kit". This nitrous kit will enable you to gain an additional 1-2 tenths and 2-3 mph on the quarter mile without being obvious. 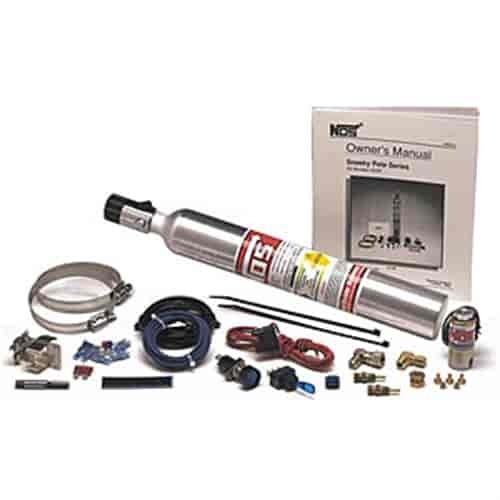 Kit comes complete with a nitrous solenoid, nylon nitrous line, 10oz bottle, wiring, battery holder (requires two 9 volt batteries) & an assortment of jets. Note: This kit will require the carburetor to be jetted over and above what is normal, since you will be compensating for the nitrous from the Sneeky Pete Kit and there will be no additional fuel source. You can use this on any internal combustion engine. Please check the instructions for details. Yes, this can be installed on any application. Can I install this in a 2003 Crown Vic with MSD ignition? This is a fairly universal kit, please review the instructions tab to determine if you can mount this kit. NOS has not designed it for your application.